SMTI hosted representatives from the US Army and Navy to demonstrate our 2RT absorption chiller prototype. The trailer-mounted chiller/engine-generator package, produced 2RT of cooling using the waste heat (exhaust) of the engine. 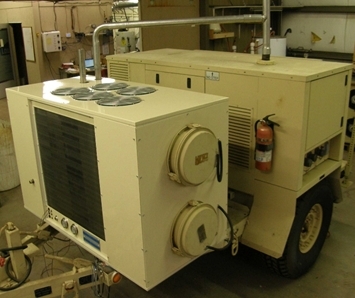 The absorption chiller replaced the electric air conditioner that is normally installed on the trailer, which requires more than half of the electrical power produced by the generator. SMTI’s prototype, using the normally wasted engine exhaust energy, provides air-conditioning while leaving the electrical power available for other base needs. Development of a 2nd generation prototype , this time with a 3RT cooling capacity is scheduled to begin in early 2017.